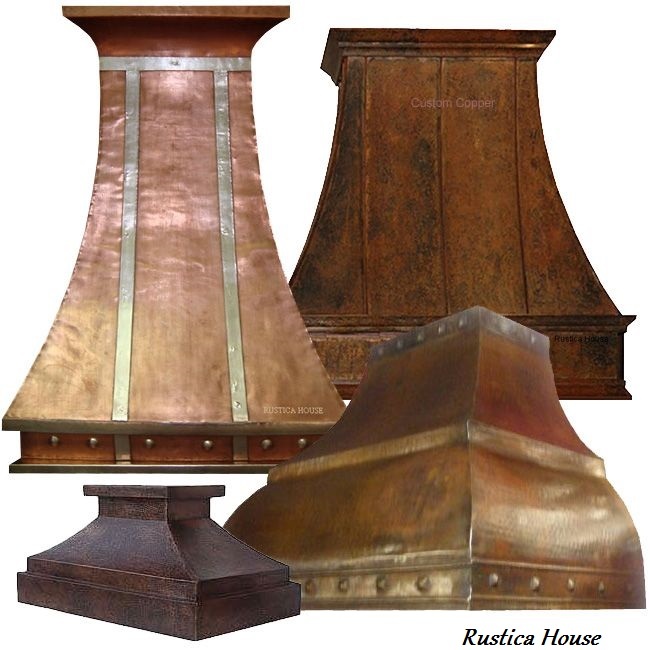 Click the button below to add the Copper Range Hood '0166' to your wish list. Exhaust vent hood made of copper has value-added appeal. Hood model '0166' is tall designed for a range in a high ceiling residential or restaurant kitchen. It can be mounted on a wall or above a gas stove central location. Choose $200 custom work option to prepare it for a specific brand ventilator. We will need to know the system brand and model number. As low cost alternative this exhaust copper vent hood can be equipped with 200CFM unit furnished with controls, light and filter. Order delivery takes a month. Wash with hot water and soap solution, dry with a towel. Don't use strong cleaners nor metal wool. Surface exposure to acidic foods not recommended. Acid and citrus juice might discolor metal. A contractor assistance is recommended for this exhaust copper vent hood installation. Proper connections will assure seamless operation.